I recently visited my three sisters, who live in widely scattered locations in Northern California. Starting in Sacramento, I drove north to the foothills near Chico, southwest to Santa Rosa*, and then south to Half Moon Bay. Although I enjoyed my visits with each of them and my brothers-in-law, most of the images below focus on the part of California that attracts me the most: the Pacific Coast. 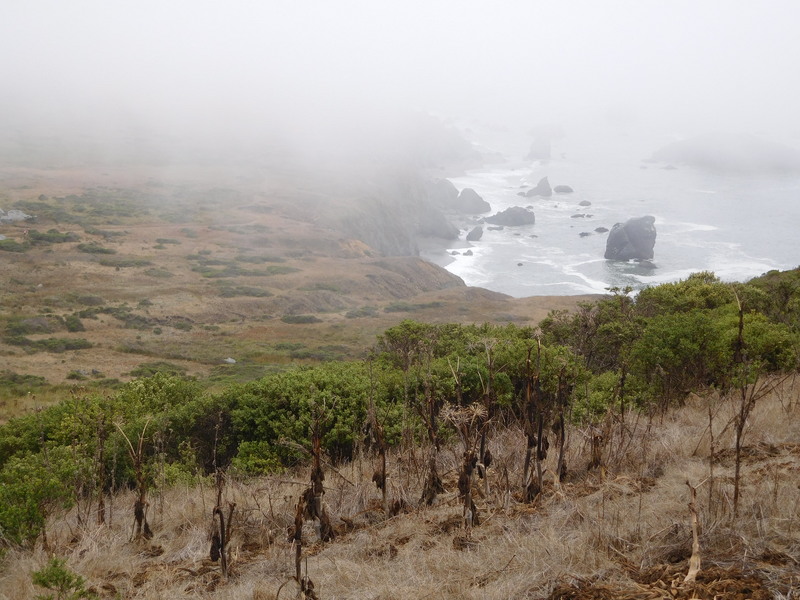 I revisited some favorite spots along the coast from Half Moon Bay to San Francisco, and visited a few places farther north that I’d never seen. 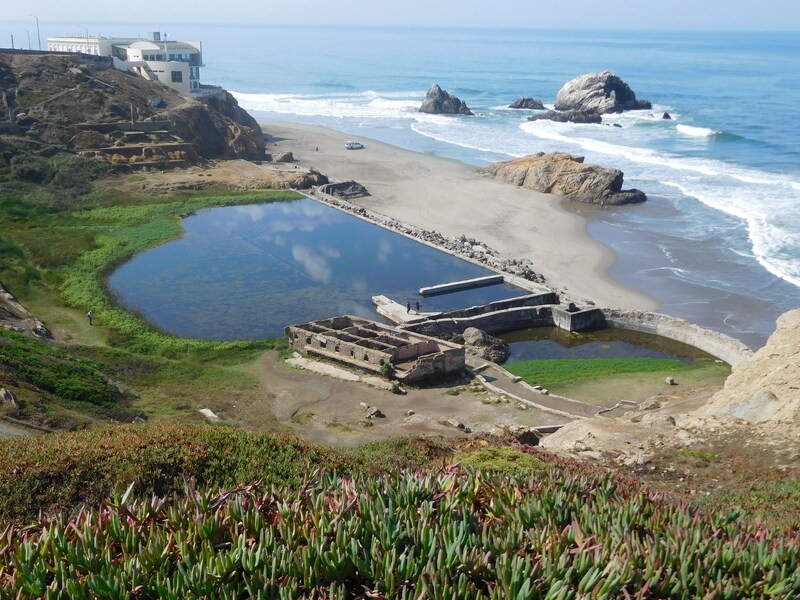 Below the Cliff House restaurant (the white building to the left) in San Francisco are the ruins of the Sutro Baths, a massive indoor recreational facility built in the 1890s and demolished in the 1960s. 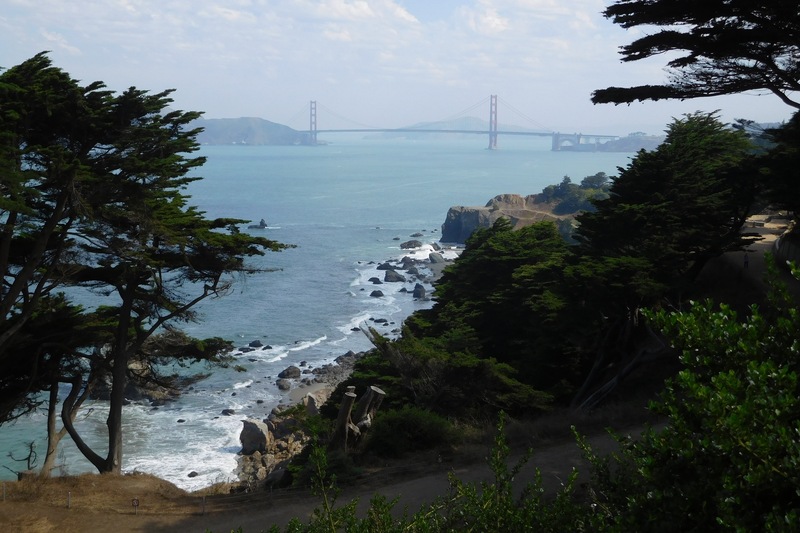 Trails with lovely views of the coast and the Golden Gate Bridge thread through the area of San Francisco known as Lands End. It is part of the Golden Gate National Recreation Area, which includes much of the coastal areas north and south of the bridge. The Beach Chalet, a restaurant and pub, sits at the ocean end of Golden Gate Park in San Francisco. 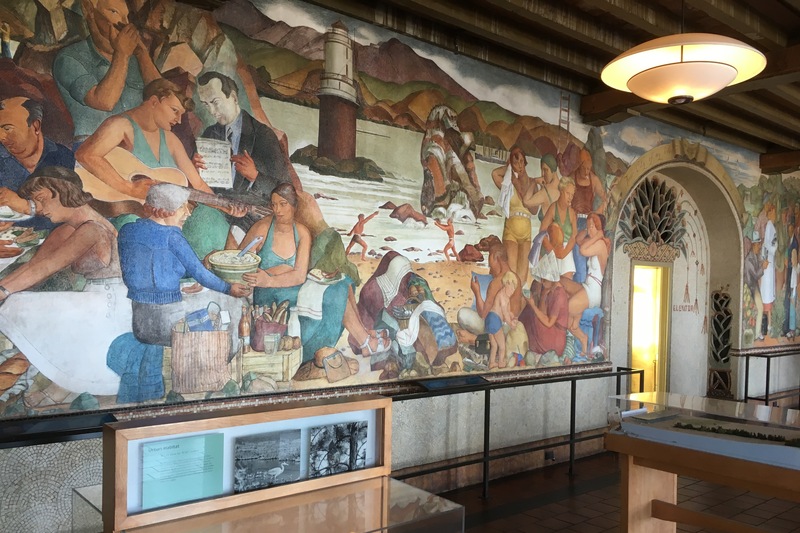 It is worth visiting just to see the Depression-era murals depicting local sites and scenes that cover its lobby walls. My sister Deborah took me to Redding in north-central California to see the artfully designed Sundial Bridge. 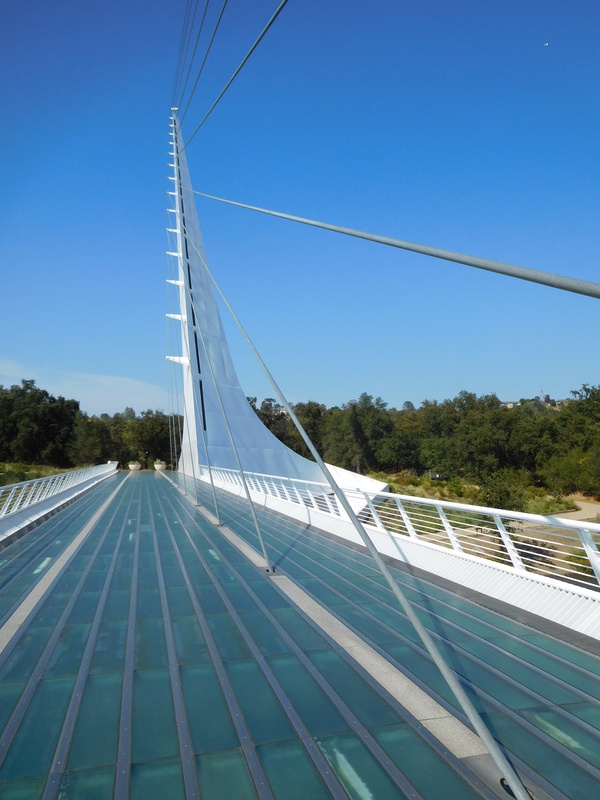 This pedestrian bridge with its glass deck spans the Sacramento River. The bridge’s suspension cables are held up by a single pylon, which also serves as the shadow-casting gnomon of a large sundial. 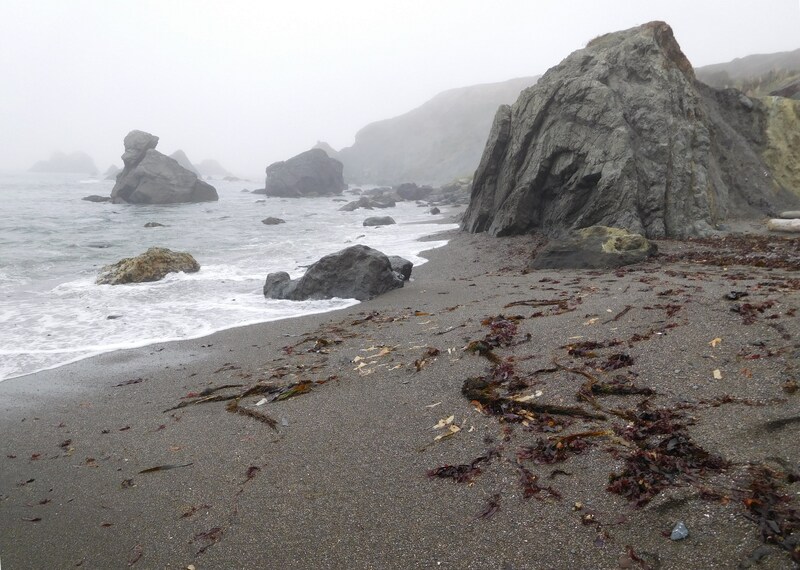 My sister Maryanne and I walked a trail along the ocean bluffs in Sonoma Coast State Park, north of San Francisco. Maryanne and I also walked down from the bluffs to visit Shell Beach. The tide was in, so we couldn’t reach the tide pools. 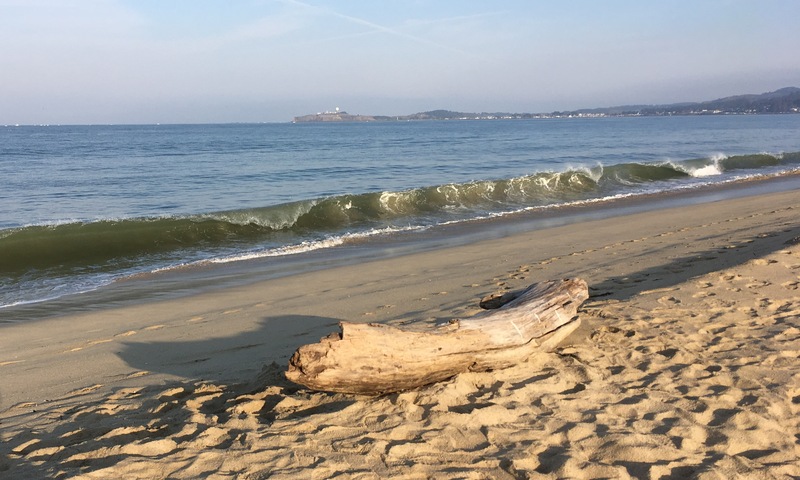 When I stayed with my sister Judy in Half Moon Bay, I started each morning with a walk to the beach. Although placid now, in winter these waters become the site of one of the world’s premiere surfing competitions: Mavericks. The waves at the Maverick’s surf break, a half mile offshore, can reach 60 feet high. My sister Judy and I took an overnight trip down the coast to Monterey. 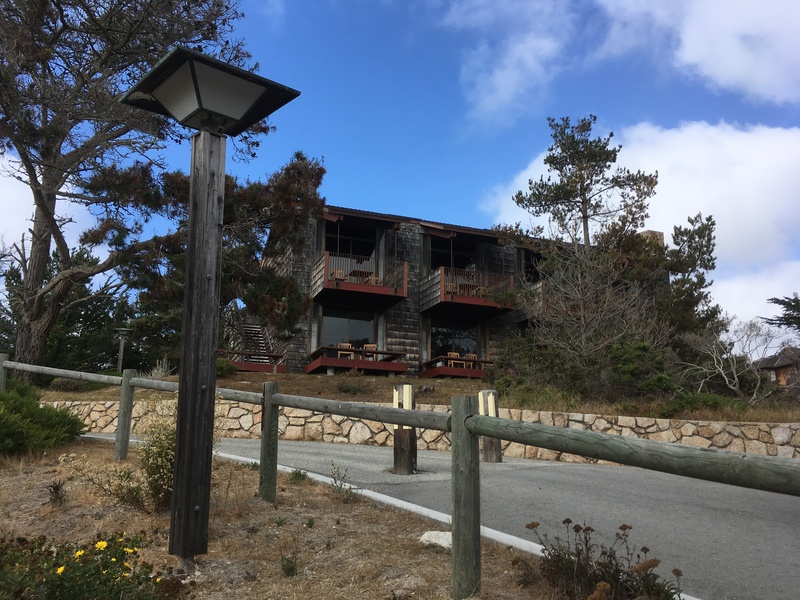 We stayed at Asilomar, a conference center and hotel overlooking the coast in Pacific Grove. 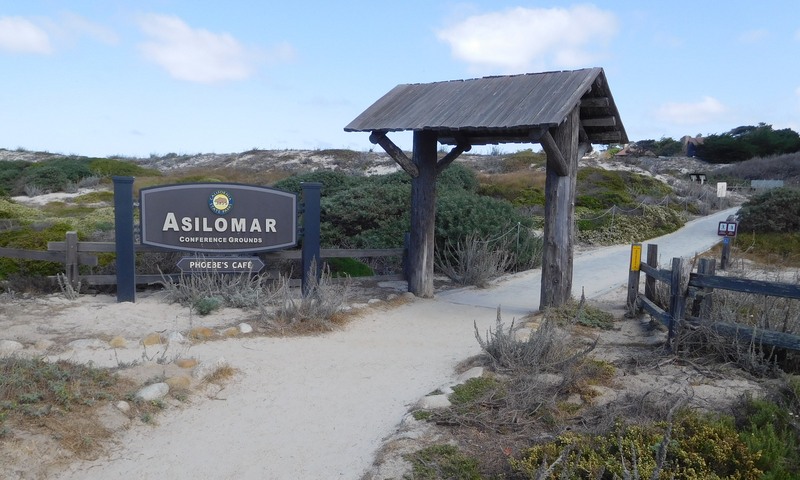 The Asilomar conference center and hotel lies just past these dunes. 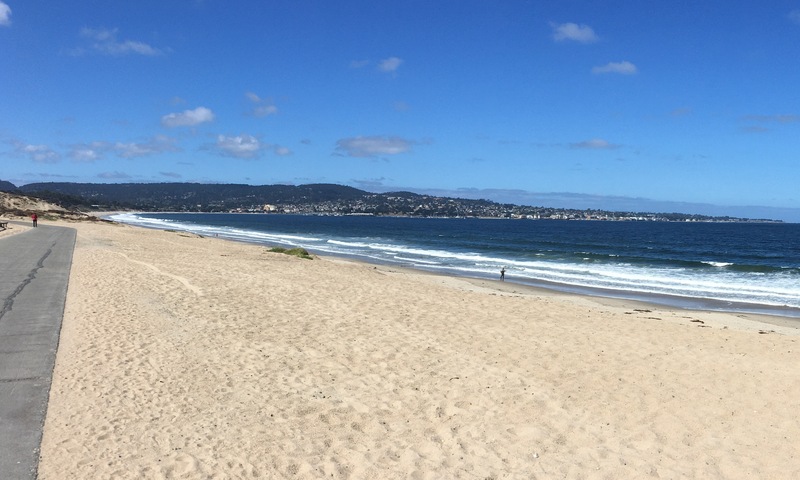 Close to both Monterey and Carmel and a short walk from the beach, it’s a beautiful and relaxing place to stay. 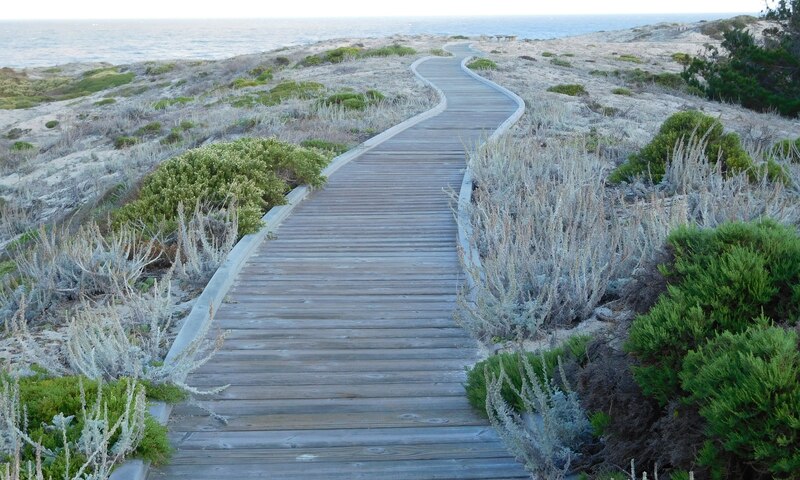 Boardwalks lead across the dunes from Asilomar to the beach and tide pools. Assilomar began as a YWCA Leadership Camp in 1913. 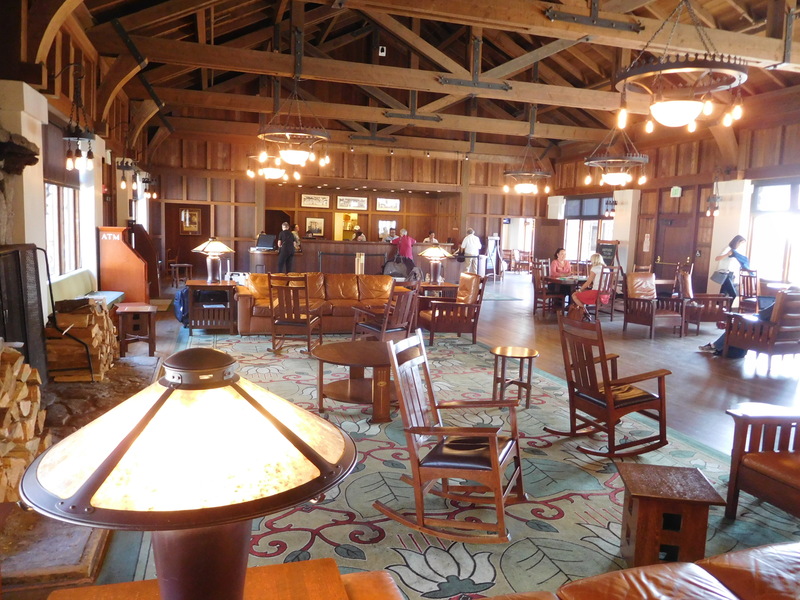 Now a state park, it has many buildings dating from 1913–28 and designed in the Arts & Crafts style. The Social Hall, shown here, is the heart of the complex. My ocean-view room, in the upper-left corner of this building, was a short walk from the Social Hall and not far from the beach. 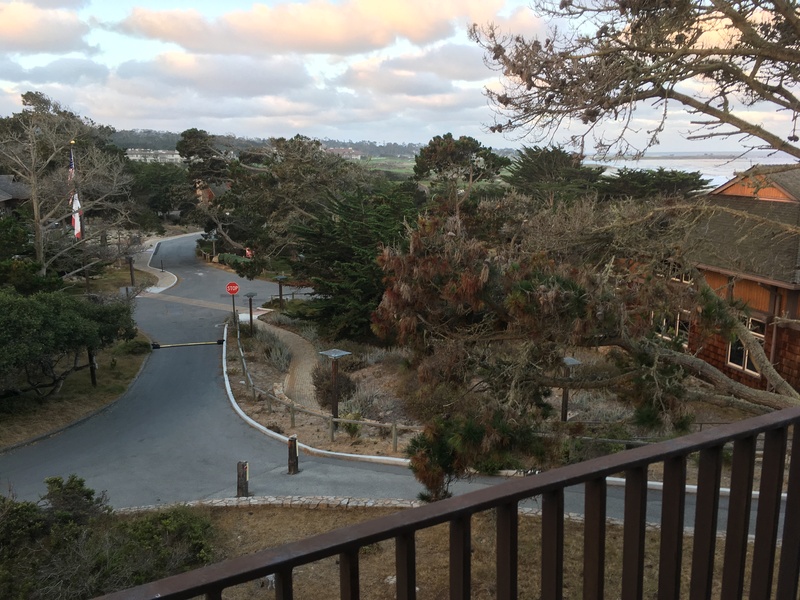 My balcony offered sweeping views of Asilomar and the ocean in the distance. I could hear the sound of the waves through the open balcony door. 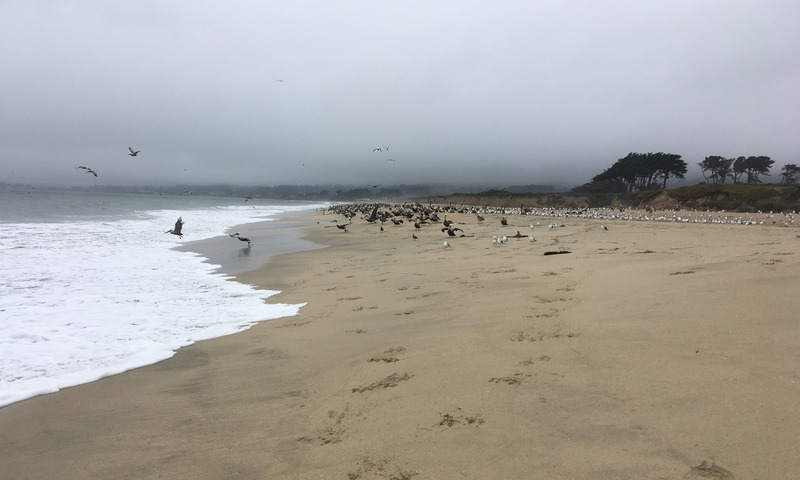 My goal on this visit to Monterey was to bike the Monterey Bay Coastal Recreation Trail, a rail trail that extends from Pacific Grove through Monterey and northward up the coast. 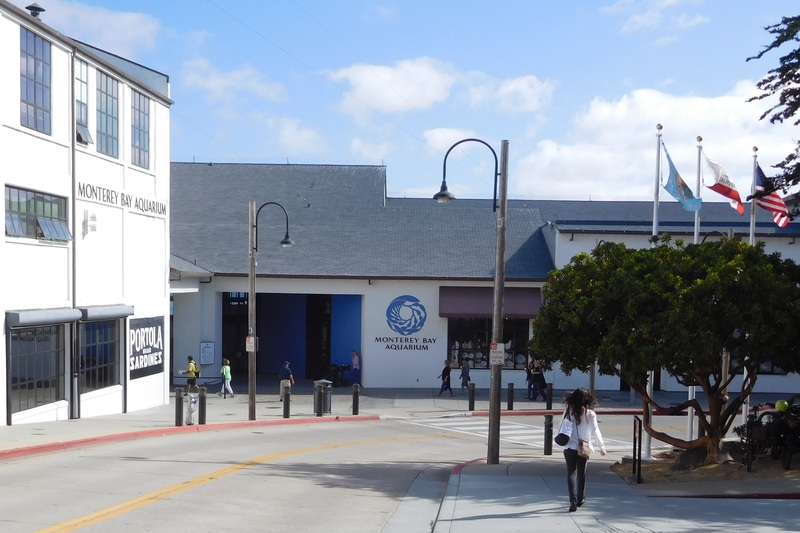 The trail runs right beside Cannery Row and the terrific Monterey Bay Aquarium, which occupies the former Hovden Cannery. 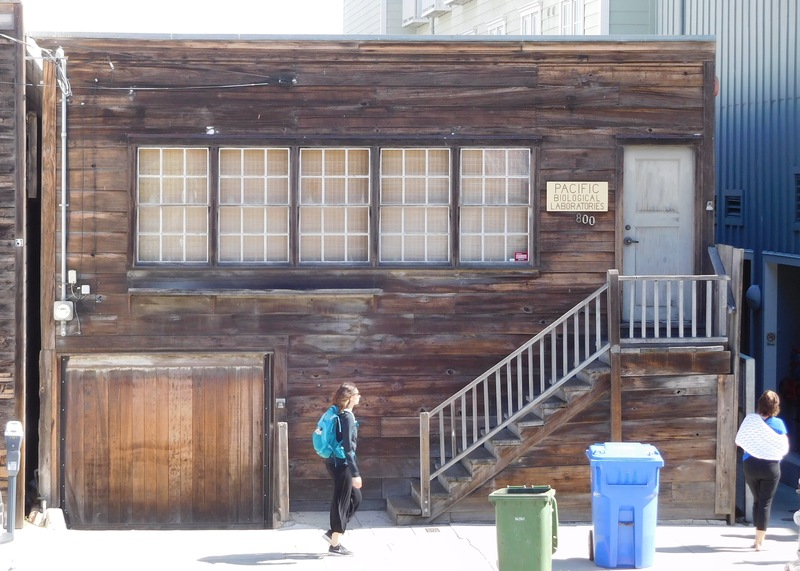 From the bike path you can spot what was once marine biologist Ed Ricketts’ lab. A close friend of John Steinbeck, Ricketts was the inspiration for Doc in Steinbeck’s novels “Cannery Row“ and “Sweet Thursday.“ Ricketts died in 1948 after a locomotive struck his car just down the street, where bicycles now cross instead of trains. 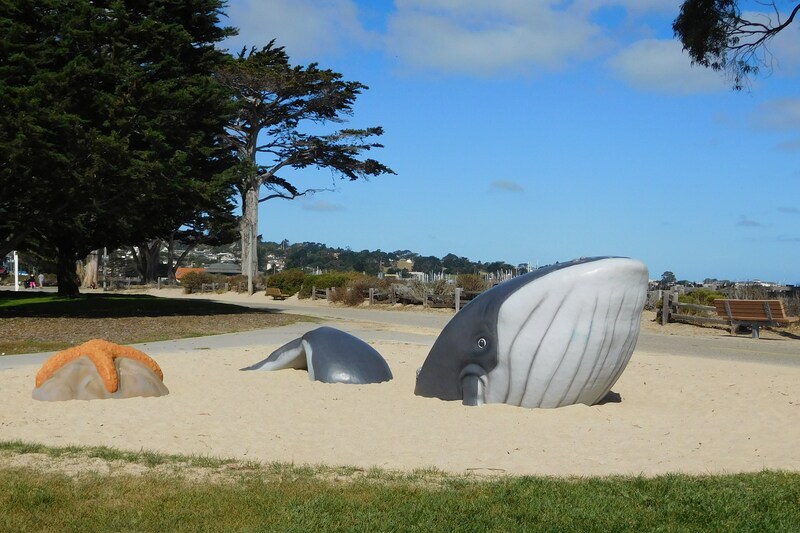 A fanciful whale and starfish sculpture along the bike path in Monterey. The trail winds through a stand of eucalyptus trees, whose medicinal aroma always reminds me of my first trips to California in the 1970s. The bike path enters the coastal dunes as it leaves Monterey. 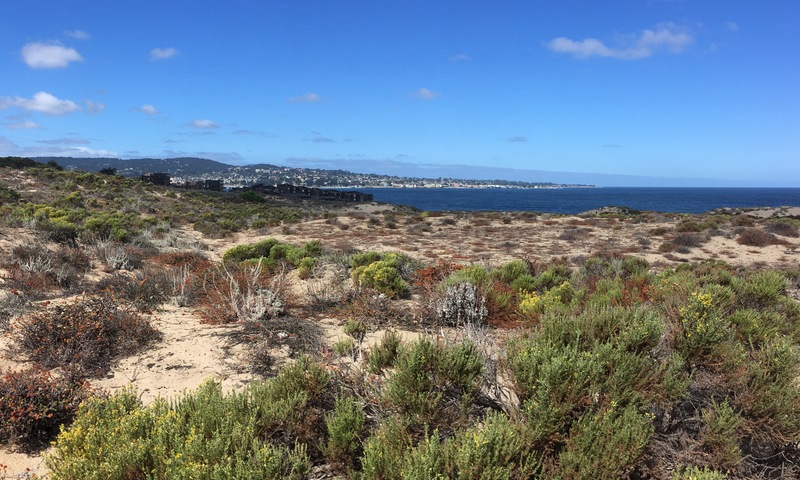 From the top of this dune you can see Monterey and Pacific Grove in the distance across Monterey Bay. At one point, the bike path runs right beside the beach. 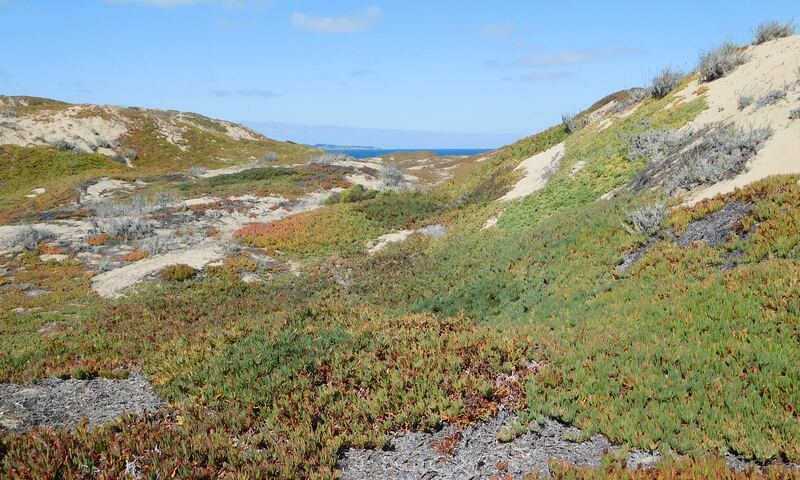 The bike path passes through Fort Ord Dunes State Park, then veers inland toward the “Artichoke Capital” of Castroville, where it ends. I stopped at Sand City, just outside Monterey, and turned back. 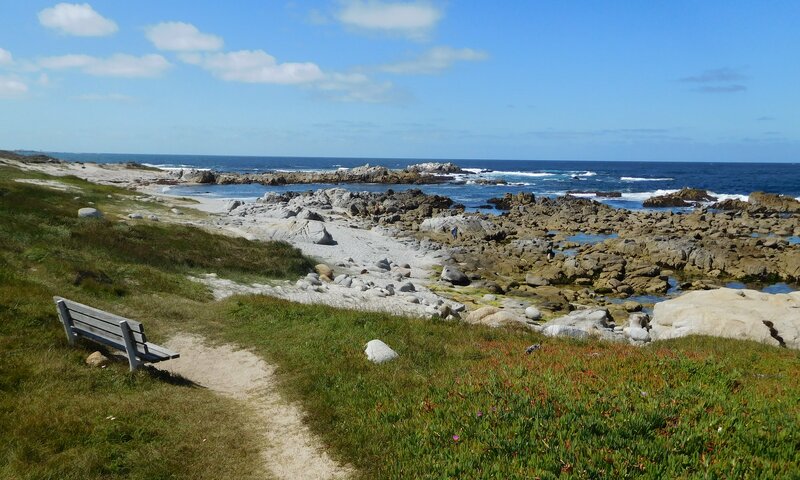 I retraced my route to the trail’s western end at Lover’s Point in Pacific Grove and continued on the coastal road back to Asilomar. Those last few miles were among the most beautiful, as I rode past beaches and tide pools. Whenever I visit the ocean and it comes time to leave, I always find it hard to turn away. One last view of the tide pools at Asilomar State Beach . . .
. . . And my last morning walk on the beach at Half Moon Bay. 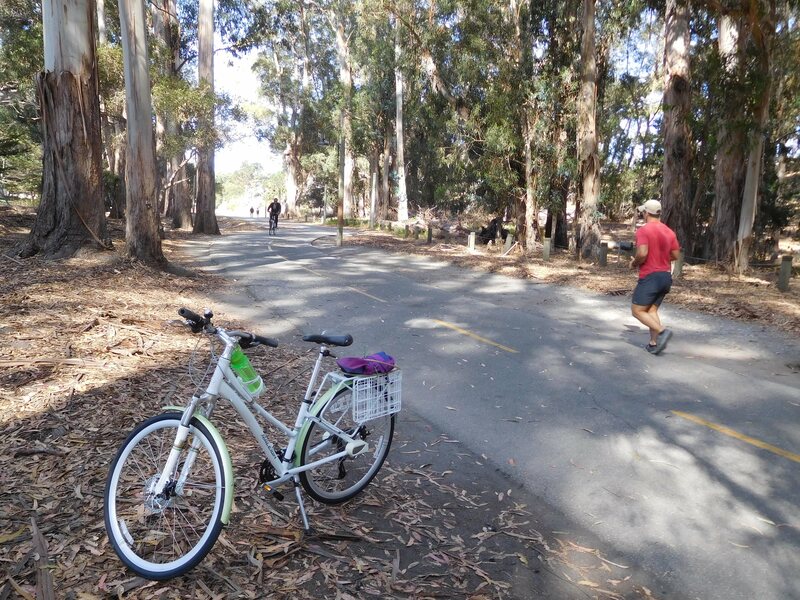 This entry was posted in Bicycling, California, Driving and tagged Bike Overnights, Rail Trails. Bookmark the permalink.